Hi everyone! 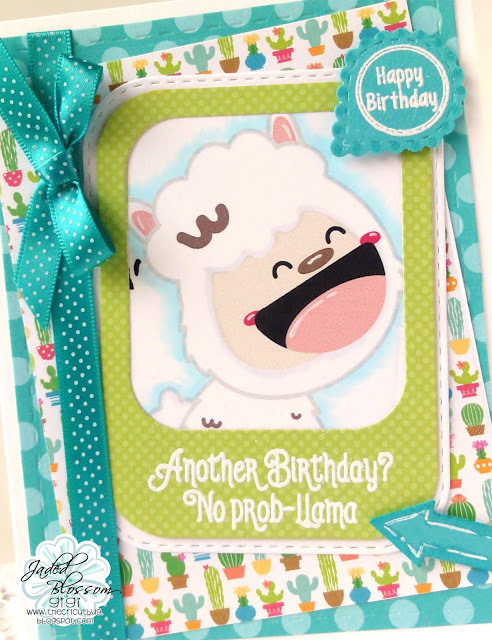 This is GiGi from The Cricut Bug and I am sharing this fun Llama Birthday card I made. I printed the llama from a graphic set from The Happy Graphics and doctored her up with Copic Markers and a white gel pen. I cut out the frames, arrow, and tab using the Layered Frame and Journal Die and heat embossed the sentiment onto the frame using the Llama Tell You stamp set. I heat embossed the sentiment onto the tag using the Birthday Candies 2 and added the arrow pointing to the sentiment. I love this it is so cute! !